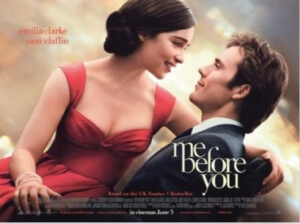 Jojo Moyes adapts her 2012 bestseller Me Before You into a functioning screenplay, in turn directed by Thea Sharrock (making her feature debut after working on the BBC’s The Hollow Crown), which sees a bubbly young woman by the name of Louisa Clark (Emilia Clarke) finding a job as a caregiver to a wealthy young man named Will Traynor (Sam Claflin), who has been paralysed from the neck down after a road accident and unable to move again due to his spinal fracture. Naturally, both Louisa and Will end up forming a special bond with each other, and sparks soon fly between them… or at least they would, if Will didn’t have other plans already set in motion. Such plans, without going too much into spoilers, involve certain practises in Switzerland, which also give way to some heavy themes of doing what is right and what is necessary, but also at what personal cost. The film doesn’t bog itself down too much into the arguments surrounding it, but they are there long enough to leave at the very least just a dent of an impression, instead of jamming it down our throats like a much more manipulative film would try to do. We have no personal opinions on this subject matter, mostly because we’re not quite smart enough to offer a sound and just argument to one that is already rather sensitive, though that shouldn’t stop this film from introducing these arguments to audiences without being too one-sided about it. For what is by most definitions very sensitive material, it’s handled fairly well here by people who have at least some understanding of what it is they’re actually talking about. Of course, that’s not what the film’s primary focus is on; it’s where it needs to be, on the main relationship between two people who come together under certain circumstances and connect with each other in ways they never thought possible. Luckily, Clarke and Claflin are an adorable on-screen couple that make this dynamic work, and they share an easy chemistry with each other that doesn’t feel too forced or too sappy at the same time, but enough to make you feel like they’re really meant for each other underneath all the snark and wit they share with each other. Individually, they are fine performances too; Clarke as, erm, Clark doesn’t overplay the quirkiness of her character and she manages to bring a natural element to her sparky character that makes her likeable and never obnoxious; and while Claflin has a little more material to work with despite being confined to an electric wheelchair for almost the entire running time, he doesn’t oversell his character’s woe-is-me attitude and can come off as sympathetic even when it becomes clearer what his long-term intentions are. Also be on the look-out for other fantasy actors taking smaller parts around the main pairing of Daenerys Targaryen and Finnick Odair; Charles Dance pops up as Will’s dad alongside Janet McTeer as his mother, former Doctor Who companion Jenna Coleman comes in and out as Louisa’s older sister, Downton Abbey’s Brendan Coyle is there as her dad, and even Matthew “Neville Longbottom” Lewis makes an appearance as her self-centred fitness instructor boyfriend. It makes you wonder if the casting director was actually doing their job, or was just a huge fan of Game of Thrones, Harry Potter, Doctor Who et al; either way, it worked out just fine. Since this is all but a doomed romance, not unlike The Fault in Our Stars (which this seems to have been greenlit solely based on the success of that adaptation), there has to be some kind of tearjerker factor – but do audiences need to stock up on Kleenex before going to see this film? Honestly, not really; sure, there are some sad parts here and there, but they’re not up to the level that The Fault in Our Stars managed to pull off, with sniffy noses and silent sobs all around you in the auditorium, but maybe you can chalk that one down to how this story, as wholly decent as it is, just might not be as emotionally powerful as John Green’s book was. By comparison, Me Before You is not as emotionally manipulative as The Fault in Our Stars, and if anything it handles its own delicate subject matter a little classier than the other one, but there was something in that other film that managed to reach out further to its audience, and whatever it was it definitely touched them to a point where their emotions couldn’t handle it. Sadly, it isn’t the same with this one; as much as you understand the drama behind it all, the story never quite reaches that soft spot enough for it to leave as big an impact, and you’re left with a film that earnestly tried to stir powerful emotions, but didn’t quite mix it well enough to leave quite as memorable an after-taste. It might not make you cry rivers, but Me Before You is still worth checking out if you just want to see a sweet romance, where the two leads just happen to be played by the Mother of Dragons and that bloke from The Hunger Games. Me Before You is a charming romance which is boosted by the delicate handling of its sensitive dilemma and the sweet appeal between its two co-stars Emilia Clarke and Sam Claflin, but it can lack the emotionally-charged punch that made The Fault in Our Stars a more effective tearjerker.